Imagine there's a country in the Middle East (let's call it country "I") that is immediately next door to another country that we could, for the sake of argument, refer to as country "P". Imagine that for "security reasons", cancer doctors in country P cannot easily travel abroad for the training and networking that would keep their skills up to date; and that country I does not allow country P to import equipment that would provide radiation treatment to children with cancer, likewise for "security reasons" [Footnote]. So country P has to send its cancer patients to neighboring countries to receive advanced medical treatment. Country P pays for about five-sixths of its seriously-ill patients to be treated in country P's neighbors, Eg and Jo. Country P pays country I to provide medical treatment to the remaining one-sixth, even though the travel restrictions that country I imposes on the residents of country P means that they are sometimes reduced to carrying their desperately ill children to hospital on their backs, cross country. Imagine that country I pockets the money that country P pays it for cancer treatment, but when country P's child cancer patients arrive for treatment in country I, country I's doctors treat them cursorily with obsolete medical equipment that they no longer use to treat country I's own children with cancer. Of course, the children from country P die. When confronted, the doctors from country I blame the children's parents, saying that country P is a country of "fourth-rate" doctors and its parents shouldn't expect their children to receive first-rate medical care. And then read Toxic Treatment and discover that it's not your imagination at all, but there really is a country I that takes money from a country P, and in return provides substandard treatment to children with cancer. And the children with cancer are real too. Two of them are Farah Jamal Harma (aged 10), and Hayah Azam Abu-Qabatya (12), and they're dead. But remember: if doctors in Israel deliberately create a separate medical channel for Palestinians, which systematically gives them inferior treatment for life-threatening illnesses, you mustn't call this kind of system "apartheid", because that's "anti-semitic". And you mustn't question what kind of sick world-view produces doctors, doctors for heaven's sake, who think it acceptable to devise, implement and defend such a system, because the world-view in question is Zionism, and "anti-Zionism is anti-semitism". A bleak picture has emerged for the members of Physicians for Human Rights-Israel who are researching the state of the health system in Gaza. It is unable to cope adequately with the diagnosis and treatment of cancer. For years, Israel has prevented Gaza Strip physicians from taking specialized training at Israeli hospitals. Under closure, Palestinian doctors from Gaza are prevented from leaving for specialized training and further study and medical students cannot complete their studies at universities in the West Bank and abroad. Na'al al-Kurdi, 21, died in Gaza of metastized testicular cancer on 18 Nov 2007. Israel has kept closed the Rafah Crossing, which is the crossing point between the Gaza Strip and Egypt, since Hamas took control of the Gaza Strip in June 2007, so treatment in Israel was Na'al al-Kurdi's only hope of survival. However, he was denied permission to leave the Gaza Strip for in Israel, on the grounds that he was - although bedridden and incapable of standing - a "security threat". Photo: Ynet. 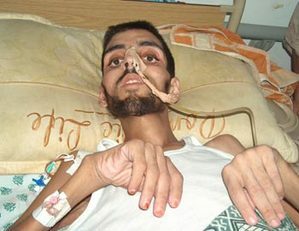 Mahmoud Abu Taha, 21, died of cancer of the intestine on 29 October 2007. The Israeli General Security Service refused to allow him into Israel for treatment, even though he had an IDF permit to do so. Photo: Muhammad Sabah , B'Tselem.